This HYF013 Honeywell Tower Fan Review is written after physically testing this model. Honeywell have a number of tower fans available on the market and looking through Amazon this one had the highest star rating. After reviewing the fan we had to wonder why this was given that it is one of the most basic fans out there. It’s not that it’s a bad fan but there are many fans with more features and conveniences than this one. If you are looking for a cheap simple fan without the frills however this one could be for you. Out of the box, you will have about a 15 minute or so DIY session. You will need a Phillips screwdriver. The fan comes in 5 parts and with screws. You can secure the fan to the ‘pedestal’. This will give the fan a lot more height than some fans that attached directly to the base. The process is relatively easy but you will need to get the order of things correct. You slide the cord through the middle of the two pedestal pieces then connect the pedestal. Once that is together then you screw the pedestal to the bottom of the fan. Then attach one side of the base to the pedestal with a screw, then slot the second side of the base on top and secure that with more screws. There is a slot for the cord to feed out so the base is not sitting on it. There are also some plastic pieces that secures the cord into this slot. The assembly isn’t too difficult. If you can work a screwdriver you should be fine but it will still take around 15 minutes of your time. The parts of the base are plastic and with that, don’t have a high-quality solid feel to them. After seeing the box the fan came in I was wondering how dated this fan was going to look but actually, visually, it doesn’t look too bad. It is somewhat dated in the fact that it is completely analog, for some people though, that may be a preference. It’s made of primarily plastic on the outside which looks ok though while assembling the base I thought it had that flimsy plastic feel which might break easily given the wrong circumstances. While using on the carpet the fan is fairly stable on the base, but the unit does move around a bit so it does wobble back and forward if it’s pushed or bumped into. There are no lights on the fan so you won’t have the ‘bright light’ problem many of the digital fans seem to have. Being a fairly big piece of equipment being able to move it easily is quite important and this fan has a built-in handle for easy moving. Up the top at the back of the fan is a handle/groove built into the design (pictured above). As you can see above the Honeywell fan comes with the three fan wind speeds. This is pretty much the bare minimum for tower fans with some fans such as the Dyson Am07 coming with 12 speeds. A big factor for many purchasers of tower fans is how much air does the fan blow. Often the manufacturers will give you a CFM measurement and sometimes you may not even get that. We found that this was listed as 350 CFM. In our reviews, we want to give you a tangible measurement which you can use but also be assured that has been tested physically by an unbiased source. So in the below graph, we have measured the maximum wind speed the Honeywell tower fan which will give you and idea of the airflow it is generating. 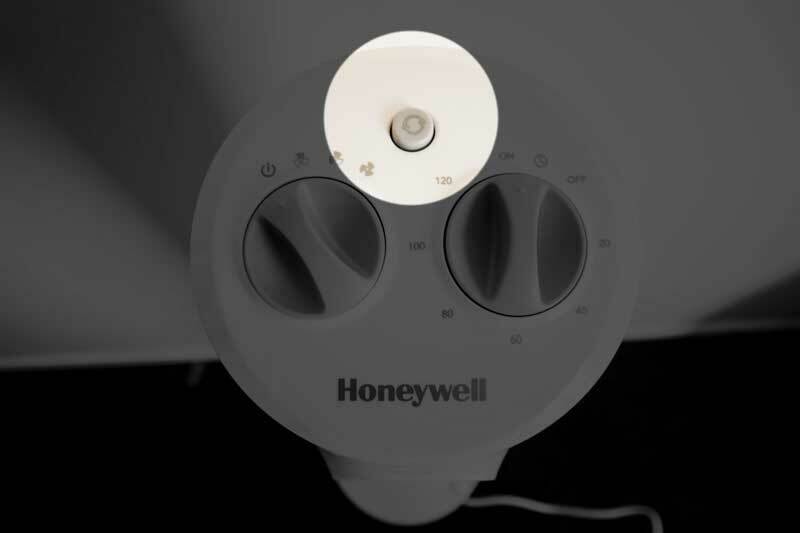 On its lowest setting, the Honeywell fan is pumping out air at 6.85 m/h. On its medium setting, it’s maximum wind speed generated is 8.82 m/h and on it’s highest setting the maximum wind speed reading we recorded was 10 m/h. We keep all our tests as similar as we can in order to give accurate comparisons so to see how we conduct our test click here. Oscillation on the Honeywell tower fan is controlled by a simple button on the top of the unit. Again the button feels a little bit low quality but it works as it should. The angle of tower fan oscillation varies a lot between fans and this fan is on the lower and of the scale in terms of oscillation degrees. 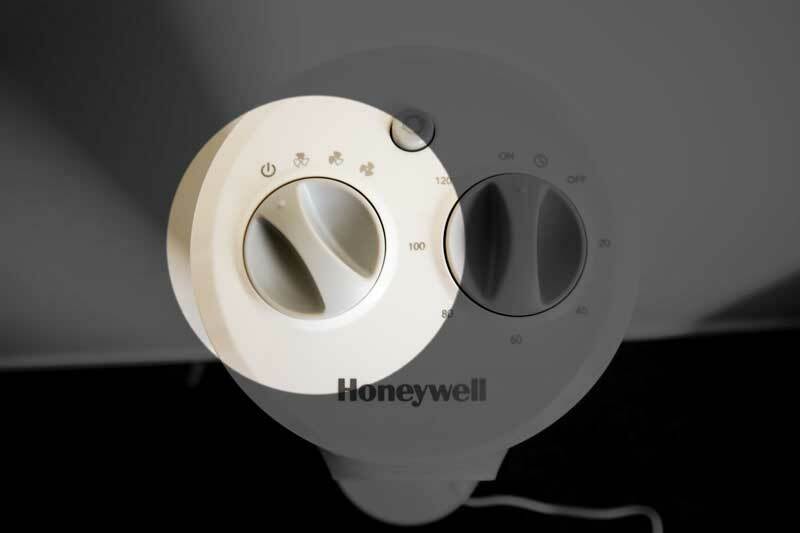 The Honeywell tower fan timer goes up to 120 minutes as you can see below. The timer is pretty rudimentary as far as tower fans go. Being analog there is no way to see how much is left on the timer, you can only gather a rough estimate. Given that there is no remote either you cannot adjust the timer without using the unit itself which is not ideal if you are wanting to use this in the bedroom at night time. You will have to trundle out of bed to make any changes. Also, the knob actually feels kind of cheap when you use it. Controls on the Honeywell are real, as basic as you can get, for some people that is a positive but in this case, it doesn’t give you a whole lot of control over the settings. The AM07 can be programmed at 15-minute increments up to 9 hours which is one of the best timer settings out there, so in comparison, this fan is not quite in the same league unless however, you are content with something that is very simple. When using this fan, in order for the fan to be on the timer has to be set, so there is no turning the fan on and leaving it for an indefinite amount of time. It will always have to be on some sort of timer setting. One of the big factors in choosing a tower fan is how much noise the fan makes. If you are wanting a fan for your bedroom to use at night then you won’t want something too noisy that’s going to keep you up at night. In this review, we tested the Honeywell on each setting to find out how loud it is and in the following graph is the results. On the low setting the maximum sound coming from the fan was 50.3 db. Bump it up to its medium fan speed setting and it moves up to a maximum sound of 54.8 DB. On the all important high setting where the fan is blowing the most air the fan measured in with a maximum decibel reading of 57.4 db. To give you a frame of reference to how loud this is you can check on this noise comparison chart. This fan does not have remote control functionality. Bummer! There are a few suggested cleaning methods for the Honeywell HYF013. Cleaning the grills with a cloth for the exterior and for the inside of the grills it is suggested to use a pipe cleaner, flexible dustwand, vacuum cleaner or compressed air. Don’t ever use any chemicals or liquids to clean the fan. 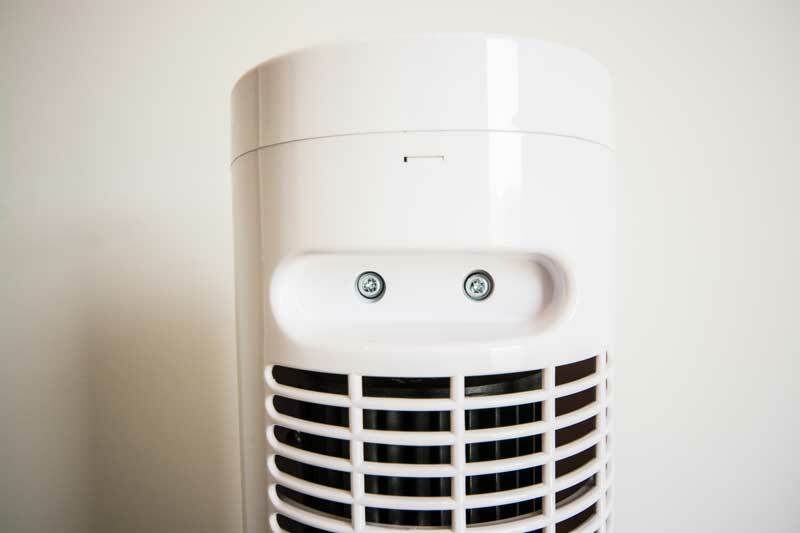 The HYF013 tower fan has an overload protection (fuse) in case of a short circuit. It also has a polarized plug for your safety and runs on 120V. If you are not in the USA you can check what voltage your country runs on here. We tested the fan on all three settings to see how much power the fan used. You can see the results on the below graph. At its lowest setting the fan was using 39 watts. Medium setting was at 41.1 w and the highest setting the fan was using 43w. To get a good frame of reference for how much this is you can compare other appliances approximate watt usage here. This fan comes with a one-year limited warranty which is only valid to the original purchaser of the product from the original date of purchase. Honeywell state that if you have a defective product you must pay the $10-$15 CAN handling/packing/shipping fee in order to return the unit. Of course, the warranty does not cover any damage from unauthorized attempts to repair the fan. Given the quality of materials, the cost of this fan is lower than most other tower fans out there at around the $40 mark. 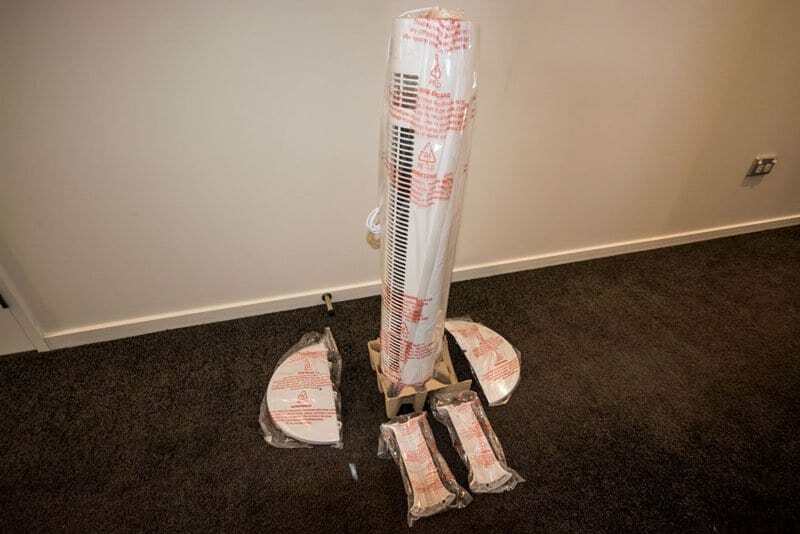 The most common issue other purchasers had with this fan was the quality of build stating that the materials were cheap and flimsy and also because of the design the fan wobbles a lot. I would tend to agree with them on that. being that this fan is one of the cheaper ones out there it is probably the price it is because of the lower quality materials. The base does feel cheap and the fan does wobble. 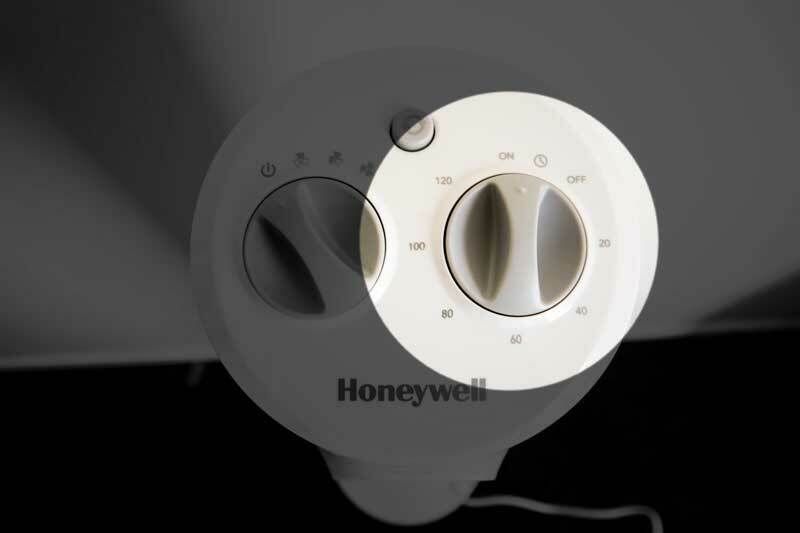 A very common complaint with tower fans is after a while some fans develop a noise often when oscillating and appears this fan is not adverse to this happening occasionally. Overall the fan has favorable ratings though, probably not as much positive feedback as some others out there, but given the low cost and cheaper materials, it’s not too surprising. The rating system also seems to favor fans that have fewer reviews and this is an example of that. This is a very basic fan with a lower price tag. In terms of functionality, it’s about as simple as you can make it. It’s analog and you have your old traditional levers to control your fan settings. These feel a bit cheap, a bit like the base of the fan as other purchasers have mentioned. Because of the cheap materials and minimal features, the fan does come with a lower price tag but it is not a huge difference between the price of this and a fan with a lot more features. It doesn’t have a lot of features like a lot of the other tower fans but it does what it is supposed to do and if you like simple this is for you. No remote control, though some see positives in that, is a big factor if you are wanting to use this at night time or in a situation that requires some easy control. Despite its cheap looking base and buttons from afar it actually looks quite good and wouldn’t be out of place in a modern looking space.